Both my wife and I consider it a privilege to meet and minister to people throughout the country and around the world. If either of us can serve you — your church, camp, conference, or event — we would be delighted. Hi Claudia. Thank you for asking. I don’t keep any of my talks around. So I’m not really sure. You are so sweet. You made my week! I had so much fun at camp. You are a amazing speaker. I will miss listening to you every day. I miss camp so much already. I hope I get to see you soon. 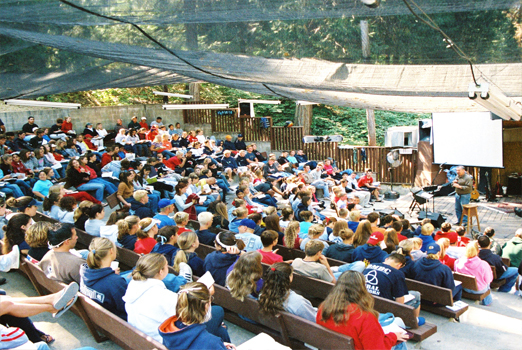 Will you be at the Hartland camp every year? I miss you so much Dewey. You Rock. Ps: I hope you reply soon. Jesus( God ) Loves you!!! That’s really really sweet of you to say. Thank you, Janea, for the kind words. It was a special week at a very special place. And you are a very special person! Hey Dewey. How are you doing? I miss you so much!!!!! My dad has an email. Do you want me to give you his email so I can contact you? Am I bothering you is that why you are asking me this? I’m truly sorry if I am bugging you. I’m trying not to bug you. So would you like my dad’s email? Ha ha. No, you’re NOT bugging me at all. It’s just that using the website to write is kind of clunky. I don’t always check for comments, whereas email comes right to my computer and phone. So it’s totally up to you. I would only suggest that you check with your dad first to make sure he’s cool with you using his email address. Hey Dewey!! My dad said it would be okay that I used his email. So his email is kendenm4@verizon.net. I can contact you through there. First let me say that I am glad to see you are doing well. I had you as a visiting teacher when I was at Word of Life BI in Schroon Lake back in 1988, and seriously considered attending Azusa Pacific Univ. after finishing there (but went in another direction). I must say, I remember you with much more (and darker) hair and a (slightly larger) mustache. I recently watched some folks from APU on The History Channel basically sitting there saying that the Word of God not only contradicts itself but is errant on many facets. How can these people be allowed to teach at a school that is supposed to uphold Christian values, not to mention train Christian leaders? I think if Jack were still around he would be appalled at the statements made by these people. I actually am curious to know if any of these people actually BELIEVE the Word of God to be true and inerrant. My wife actually made the comment, “Why would God allow these people to do this?”. Number 1, are you still associated with the school, 2, have you seen this show (Bible Secrets Revealed), and 3, what do you think about what these people are doing to Christianity as a whole? Hey Dan. You bring back so many good and precious memories. I haven’t been back to Schroon Lake since Jack went to Heaven. I often think fondly of that special place and would LOVE to get back there soon. No, I haven’t seen the show. But I share your alarm at what you’re hearing. It grieves me to think that people would use a platform like the History Channel to demean God’s Word. But tragically, that’s become the fad these days. I’ve been teaching the Bible now for over 40 years, have heard all of these arguments before, and can tell you that I am as committed to the inerrancy of Scripture today as I have ever been. (In fact, on the podcast of two weeks ago (#49 in the Jesus in High Definition series, I gave an entire message on the authority of Scripture from Matthew 5:18-20. I hope you are well, Dan. God bless you and your wife. Just a note to say that you and your ministry are a blessing. My dear friend Ken Brown directed me to your podcast Jesus in HD. I’m only up to episode 16 however they are challenging me. My favorite was the very unexpected bonus material. The description of your childhood made me relive many of the struggles of my childhood. Thank you for being real, humble, and for sharing God’s message with love and boldness. Thank you, Bruce, for your encouragement! Not sure if you remember me from the Master’s College days, but I was thinking of you today as I was doing my devotions in 1 Cor. 5, where Paul talks about replacing the old leaven with new leaven…that got me thinking of the many “putting off” and “putting on” passages in Paul’s other letters. My prayer was for God to help me to be more consistent and disciplined in that process. I remembered a quote you repeated often and one I try to live by: “Consistency, thou art a rare jewel.” Thanks for continuing to be a blessing in my life. Great to hear from you, Will. Have a Merry Christmas! Thank you, Anthony. Your kind words encourage me. God bless you!!! What is the physical address where I can attend? Hey Shelly. We meet in a room on the lower level of Church on the Hill in McMinnville, 5 PM on Saturday evenings. Just follow the signs. Thank you for asking.